Forget Brick Lane – Tooting is the curry capital of London! Having returned from the trip of a lifetime to the Volcanic highlands of Nicaragua, the luscious rainforests of Honduras, the hypnotic lakes of Guatemala and the exquisite Caribbean coasts of Belize I was in dire need of a reminder as to why it was I had chosen to live in the ecologically deprived city of London. Tooting’s mind-blowingly good curry houses, and Jaffna House in particular, provided me with just the spark I needed to rekindle my love affair with the capital. 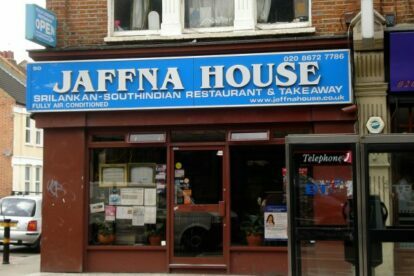 Nestled among a brash high street of halal butchers, fresh fruit and veg stalls, gold-centric jewellers and numerous curry restaurants lies the humble Jaffna House. Jaffna specialises in Southern Indian and Sri Lankan cuisine, which means the menu is filled with exotic sounding (and looking) dishes such as jam roll-like Pittu, UFO-shaped Iddly and wormlike String Hoppers. The food tastes better than you can imagine and excites parts of the palate not reached at traditional British-based curry houses. In the month that I lived in Tooting I must have grabbed their delightful £ 2.75 five-dish takeaway bag between 10-15 times – it felt like there was a magnet in my stomach drawing me back to the restaurant whenever I left the house or returned to Tooting Broadway on the tube. Jaffna restored my lust for London life and made me consider turning my kitchen into a Ping-Pong room.